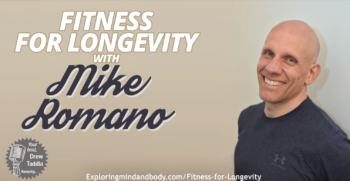 Join Drew Taddia this week on Exploring Mind and Body as he interviews Mike Romano on Fitness for Longevity. Mike is co-owner and senior personal trainer Longevity Personal Fitness. Born and raised in Millburn, Mike has been on a path of studying the areas of fitness and health for over 25 years. He is passionate about sharing his knowledge with individuals and groups to help them feel and move better. Beyond strength, he is specifically focused on the biomechanics of functional movement and bridging the gap between theory and practical application and how it applies to personal longevity.